The sun is now setting sooner and the leaves are just beginning to show some vibrant color, but that doesn’t mean a girl like me can’t take advantage of the lingering warm fall weather to dream of being somewhere more perpetually balmy! I’ll just wear some fall color in the late 40’s Hawaiian style to reconcile myself with the now fading summer! 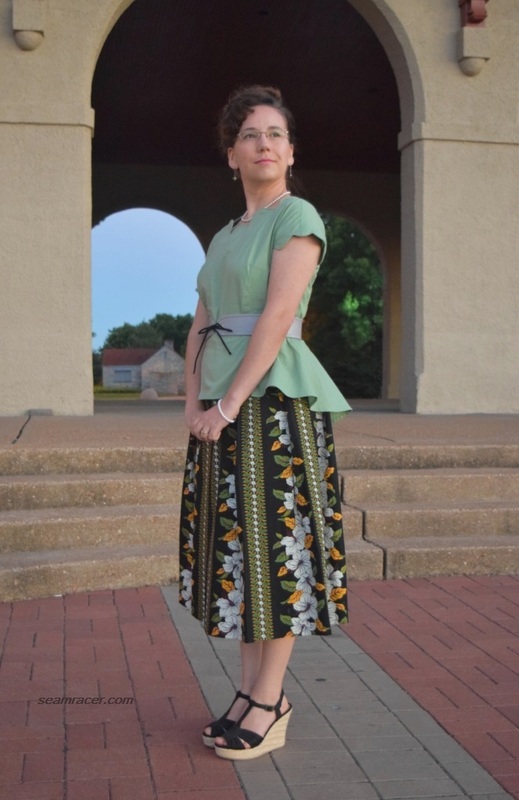 This outfit of me-made blouse, skirt, and belt was directly inspired by an outfit worn by the character of Ana Jarvis, from Season Two of Marvel’s TV show Agent Carter. However, it was also a very good opportunity to experiment with more new-to-me fashion trends – peplums and scallop edging. I have seen both peplums and scalloping in many sources for this coming fall, especially scallop edging (check out Talbots, Valentino, Zara, and Nordstrom for some higher-end starters). I also see this feature everywhere in post WWII 40’s fashion until the early 1950’s (see my Pinterest board on this for examples). 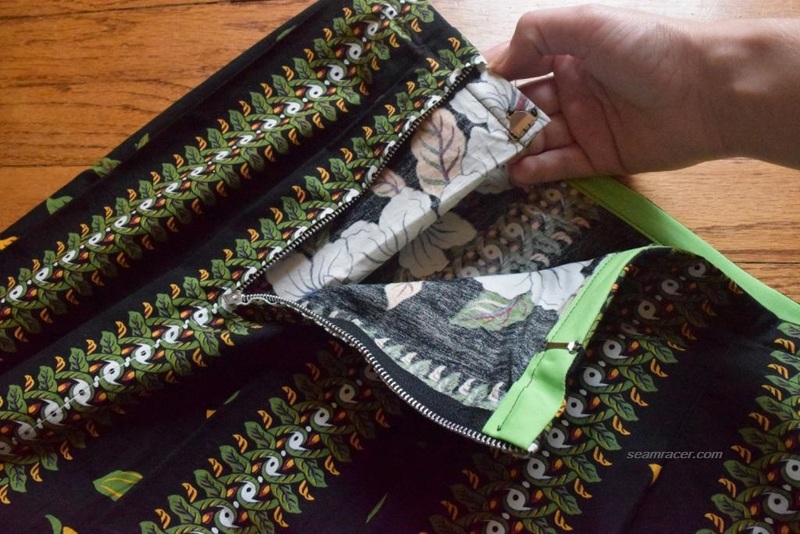 This scalloping is an easy and exciting detail that the home seamstress or anyone who sews ca n incorporate into any and all existing patterns. I will show you later on in this post. 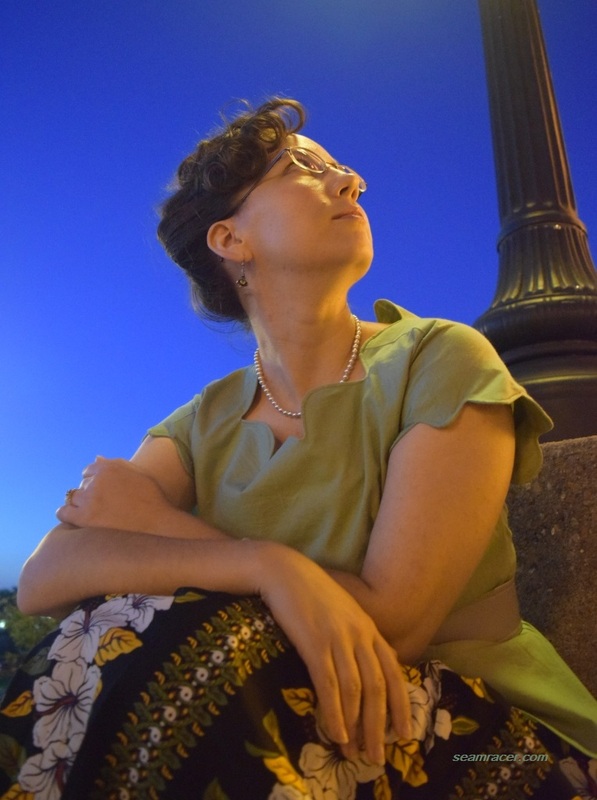 As for the peplum of the blouse I am wearing, this was a total dive into something I’ve always been dubious about as to whether or not it could be made to “work” for me. I believe it does, thanks in no small part to my awesome custom made belt, and I am now a peplum convert. The best part is the fact I have put a completely new spin on a popular Simplicity vintage re-print, #1590. 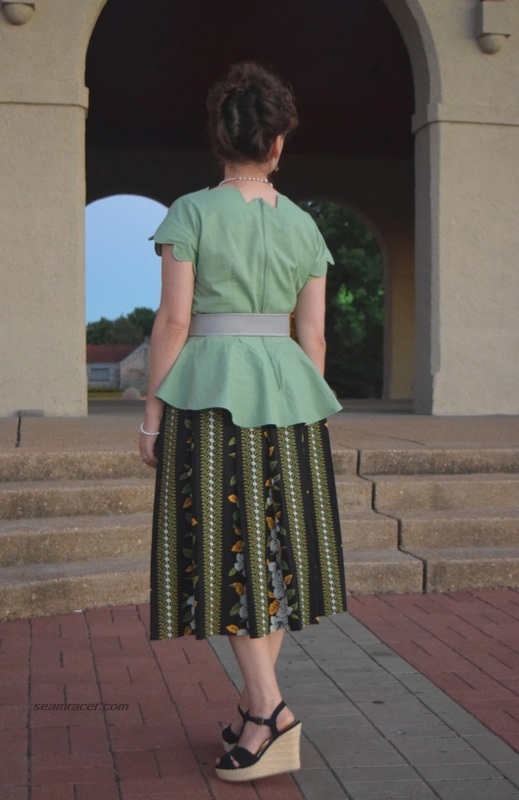 A post 1946 to pre-1955 peplum is my favorite interpretation of this style – so far! I love the bias circle flare. Peplums from this time slot were sort of like a balancing act of offering what was missing from the peplums of the preceding and following eras. Peplums of the 30’s were long and lean or short and almost non-existent, during the war years of the 40’s, there were short and frilly peplums, and the 50’s had padded, flared, or deceptively unreal inflated hips. I see post WWII to early 50’s peplums as a subtle transition to more accentuation of the hips, a classic trademark of after the mid 50’s, rather than an exaggerating emphasis on the shoulders as fashion had been doing since the mid 1930’s. Case in point, Simplicity released an almost identical peplum blouse pattern (with a different neckline and sleeves, granted) in the year 1955 as Simplicity #1344. 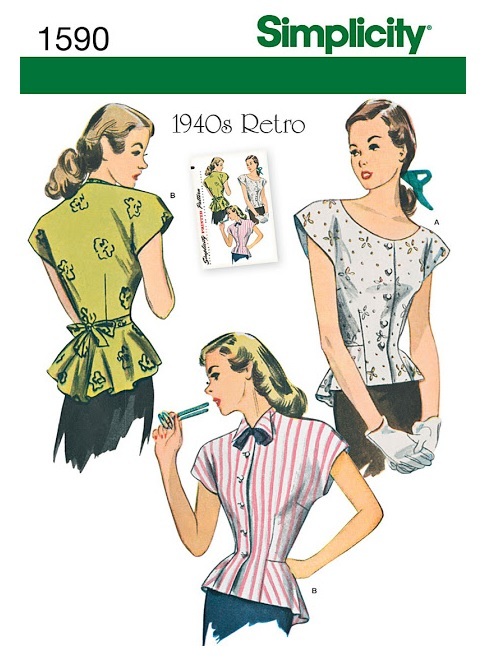 The Simplicity reprint I used for my blouse was originally Simplicity #2027, from the year 1947. Peplums nowadays are fun and varied – they experiment with anything and everything in between…long, short, half, bias, paneled. Have you learned to love peplums yet? Speaking of what I love, it’s no secret (if you follow my blog) how much I adore the fashions on Agent Carter (both seasons), and I had to branch out and try more of the fashion of the indomitable wife of Mr. Jarvis. (Here’s my first and second Mrs. Jarvis outfits.) Ana Jarvis’ personal style was strongly Hawaiian, with some Tyrolean influence of the late 30’s as well, so I figured on going for “the real thing” if I was to channel her and be authentically true to both the 40’s and the island culture. Kamehameha, the largest commercial manufacturer of Hawaiian garments, began in 1937 using tropical floral cotton prints from a dominion of the United States rather than importing Japanese textiles. After WWII, when tourists again flocked to the islands, the Hawaiian garment industry flourished (info from Forties Fashion by Jonathan Walford). I have used tropical and Hawaiian prints before, but they have been rayon printed imports (see here and here). The Hawaiian garment industry still deserves to flourish and be respected for their individual culture as an important part of America’s history. That’s why the fabric for my skirt was ordered directly from the island of Hawaii! Yes, I ordered it direct from “Barkcloth Hawaii” and it is so soft and luxurious, in excellent quality. Besides, I knew the fabric was meant for a Mrs. Jarvis outfit when I saw the fabric that was the closest match to the movie skirt was named “Ana” and a vintage print! Some projects are just meant to be. FABRIC: The skirt is a 100% cotton sateen bought from “Barkcloth Hawaii” online, while the blouse is a basic 100% cotton, American made, bought from Jo Ann’s. My belt is light grey vinyl also bought as a remnant from Jo Ann’s. 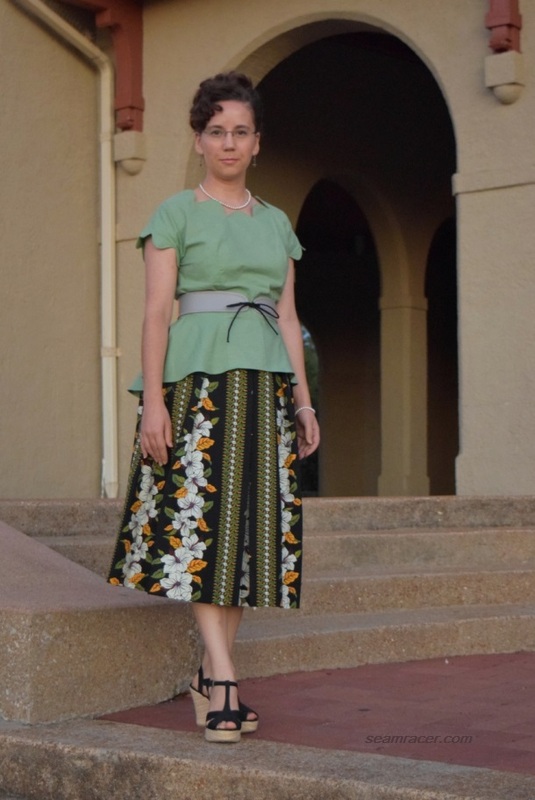 PATTERNS: My skirt and belt were self-drafted by me, while the blouse top was made using Simplicity #1590, a year 2013 re-issue of a year 1947 pattern, #2027. NOTIONS: I used everything that was already on hand to make this set – I had all the thread, bias tape, hook-n-eyes, and everything. I bought a big pack of metal eyelets a while back for corset and belt making (like this one), so two more were not a problem! The belt’s ties are actually 3 mm macramé cord…I bought a large spool of 50 yards of this stuff. (It’s great for making one’s own piping, fyi!) The skirt’s side zipper is a vintage metal one, but the blouse’s closure is a modern 22’’. TIME TO COMPLETE: The skirt was made in about an hour, and the belt took me about 1 ½ hours. The blouse was made in about 5 hours. Everything was made in July 2017. THE INSIDES: For the skirt, selvedge edges are along the side seams, and the rest are bias bound. For the blouse, most all of the seams are bias bound, too, but the side and peplum dart seam are merely edge stitched raw. The belt is double layered, so it’s self-faced. TOTAL COST: The fabric for the Hawaiian fabric cost just under $30, the fabric for the blouse cost about $12 from Jo Ann’s, and the belt was a remnant which was about $8. Thus this outfit cost me about $50. Making this set was really pretty easy, no matter what it looks like! It was just time consuming to make all three pieces and a bit overwhelming to remember all the self-drafting intricacies and adaptations I was doing. I made the skirt first, and found that if goes with a number of my already existing tops – oh yeah! Then I made the blouse, and I felt like it was okay, but not striking me immediately as awesome as I’d hoped. After the third step, making the belt, the whole outfit was instantly brought together in a way that I LOVED! It made all the extra effort to make a whole outfit so worthwhile. This happens frequently for me, most recently with this 1914 set. So often an outfit or even just a garment a missing a certain “something” to turn it from “meh” to “Wow!” This is why taking that extra effort to make that little detail or bonus piece pays off. Your outfit can give you the opportunity to respond to others with, “Thank you, I made this!”, best modern fast fashion by your individuality, and make you feel like a million! Starting in the order they were made, the skirt began with only 2 yards of fabric. I cut the length into two one yard cuts, and sewed the seams up on the sides along the selvedge. Then, I folded along the same spot along the other side of the “stripe” just where the floral section begins. The center front is an inverted box pleat, while the center back is an outward box pleat. The rest of the skirt is shaped of knife pleats that go in the direction toward the centers. This free form pleating, while making consistent folds, was brain blowing and took a tad over an hour to achieve…fold, pin, think, then take it apart and fold, pin, and think some more about sums it up. Completed, the center back and front pleats were top-stitched down for 5 inches down from the waist, while the rest where left free. 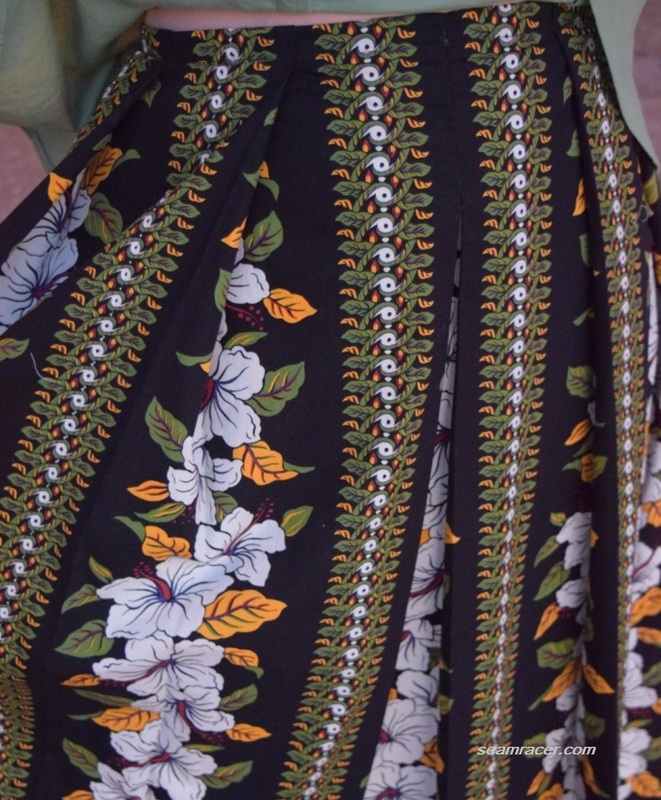 From authentic images of some pleated 40’s skirts, and someone I know that has researched the decade well, I was told that folding a vertically directional print like this is quite historically authentic, besides being fun and making it relatively easy to be consistent. Fashion in to 40’s had some truly inventive “peek-a-boo” fun when pleating with stripes and directional prints…here are hibiscus flowers hiding behind hanging branches of bougainvillea on my skirt! As it turned out, the two yards folded the way I liked just barely fit me…I couldn’t have cut it any closer. This left me with no extra fabric for a waistband like I originally intended. I suppose I could have cut the waist band off the skirt below, because there is a very wide 8 inch hem along the bottom. The wide hem helps to weigh down the poufy skirt, though, as does ironing the pleats. I didn’t really want a contrast waistband, either, so a sewing friend recommended none at all! A wide strip of bias tape was stitched on the top waist and turned under. This waist makes it hard to tuck in a top and wear a belt, but I can’t win ‘em all! For this outfit, the waist is not seen anyway. 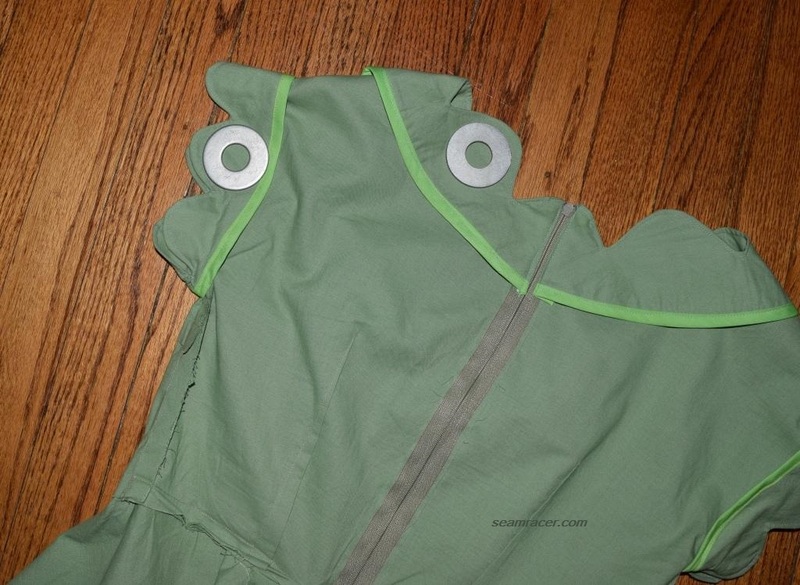 I also ended adding in small 7 inch zipper along the left side, as well, with a hook-n-eye that attaches the pleats to one another from the inside. The blouse was a real breeze to whip up, and had excellent fit and construction. It’s no wonder this pattern has been in print for a while and is used by so many! This blouse really is a winner. I absolutely love the flat front peplum with its interesting capitol T made of a combo dart and seam lines! The peplum is slightly longer in the back than it is in the front. I made my “usual” size in Simplicity for the front half and the back I went a size up for ‘’reach room”. Otherwise, believe it or not, I really didn’t change anything else besides cutting the center front on the fold rather than with a button placket, adding a zipper (with a seam) down the back center, and stitching the sleeve and neckline edge differently. I started making the neckline and sleeve edges by originally cutting them out as a straight edge. Then I drafted my own wide facings for the neck and sleeves and drew out the scallops with an invisible ink pen. Ana Jarvis’s original blouse had wide, deep, dramatic scallops, and I even counted out six around the front neckline, one straddling the kimono shoulder seam, and about 6 for the back neckline. The only item that I had on hand to use as a tracing guide which would equal the amount of scallops on the original was what I use for pattern weights… ¾ inch washer (which you can find in the hardware store). Using only half of a washer to make each scallop, with ½ inch in between each, made for two inch wide, 1 inch deep half circles. The scallops are just a tad smaller where the seams are, so my experiment turned out “perfect” (…what I was hoping for…) but still more amazing than I’d hoped. If I learned anything to change next time for self-drafting this kind of edge, it’s that the scallops might lay better if they had been made shallower than a complete half circle, but large scale looks good on this blouse in the end, I believe. I also learned the facing for scallops turns inside easily and keeps its original stitched shape if the seam allowance is trimmed to ¼ inch or less. This sort of adaptation can be done to any plain edge or even seam line, on any pattern, too. Just make sure to be precise and remember the seam lines if the scallops straddle them dead center. Then go to it with adding scallops anywhere! 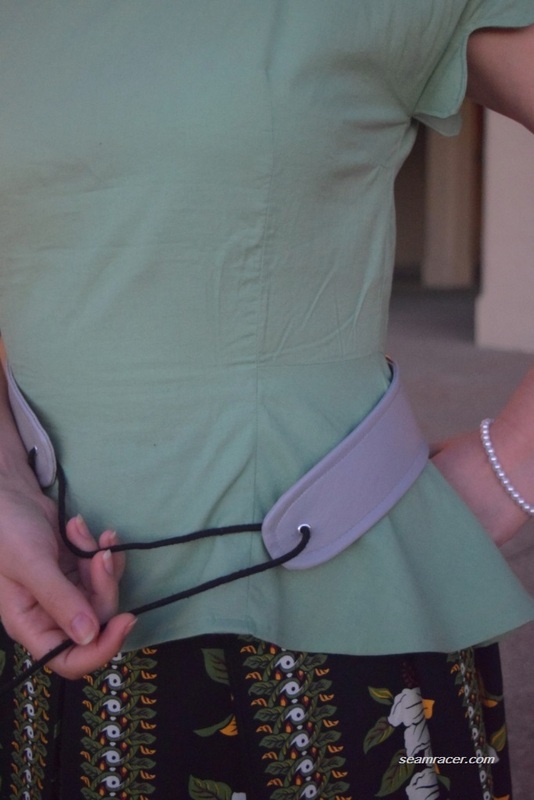 The belt was basically a wider draft off of this belt which I made for my Agent Carter “Hollywood Ending” dress. It is merely two layers of vinyl with no interfacing. The toughest part was hands down turning the two layers of vinyl right sides out after it had been mostly stitched up into a long tube…pure torture. Never do this unless you sew wax paper inside…this would’ve helped the vinyl from sticking like glue to itself when trying really hard to turn right sides out. After about a 45 minute “fight” turning the vinyl’s good side out and edges rolled out, the whole darn thing was then top stitched down ¼ away from the edge and two metal eyelets in the center edges. Add the ties, finish the cut ends, and all is done! As ecstatic as I am with this outfit, the episode from which this outfit comes is admittedly a very tense, tragic, and sad one. 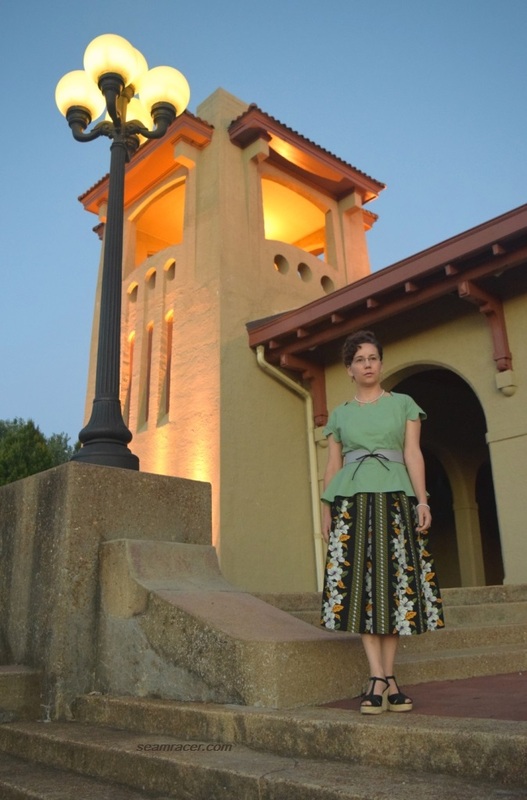 Ana Jarvis wears this blouse, skirt, and belt set for the whole of Season Two’s episode 7, “Monsters”. This luckily gave me the best chance to study and re-make versus many garments (from several characters) that get seen in short snippets. I am impressed and happy that (as has happened before) Marvel’s Agent Carter series has help me enjoy a new-to-me, completely different style and silhouette of the 1940s and early 50s and make it work for myself. No doubt it helps me like it when I know I can wear something as seen on the screens, straight from Hollywood, and be true to the era! Besides, now I have a little (very little) part of Hawaii to bring into my life, no matter where I live or what the season. This entry was posted in 1940's, 1950's and tagged "Agent Carter", "Simplicity pattern", 1940's, 1940s peplum blouse, 1940s pleated skirt, 1940s striped floral pleated skirt, 1947, 1947 peplum blouse, Agent Carter "Monsters", Agent Carter fashion, Agent Carter Season 2, Ana Jarvis fashion, Barkcloth Hawaii fabric, belt making, bias peplum blouse, Hawaiian hibiscus print, peplum blouse, retro, scalloped neckline blouse, scalloped sleeve and neckline blouse, self-drafting scallops, Simplicity 1590, vintage, vintage Hawaiian print by kellycb. Bookmark the permalink. That top is fabulous! I love how the the neckline looks and how the zipper fits right in there. Oh! that poor woman on the TV show! Good to hear! Thank you about my top. Yes, poor Ana…she’ll never quite be the same afterwards.